Steve attempting the King of the Tire contest. How fast can you fix a flat? Steve, Neil, and I just returned from Frostbike this past weekend, and as usual it was a blast. 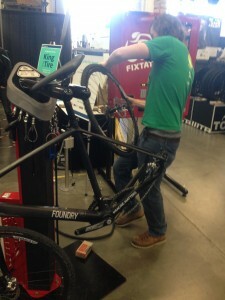 Hosted by Quality Bicycle Products at their headquarters in Bloomington, MN (a ‘burb of Minneapolis), Frostbike is an industry expo tailored to the independent bicycle dealer. It was the third time Steve and I have attended, and each time, there is something new to takeaway. Of course we get to see (and test out) all the awesome innovative new product and bicycles offered by QBP’s brands, but the industry-specific seminars and connections you make are invaluable. Shout out to Topanga Creek Bicycles in Topanga, CA! Also nice to see some familiar faces — Brad from High Peaks Cyclery in Lake Placid, and Kait from Blue Dog Cycles, who we met at the Kona Launch last year. QBP changed the home-base to a hotel in Minneapolis proper this year, so it was great to be walking distance to lots of points in the city. Between the three of us, we were able to spread out and attend a bunch of different seminars — definitely left inspired with ideas to make Mello Velo better. Pretty pumped about Saris’ new Bones car rack, Lazer’s new dial-fit for urban helmets, the Abus key program (all your bike locks can be outfitted with the same key lock! 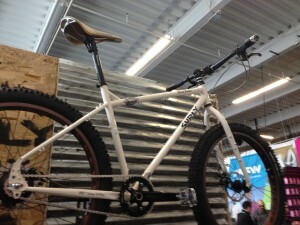 ), Kryptonite’s new pin wheel lock nut, and always exciting to visit Surly’s booth. Check out the World Troller — now we just gotta plan a bike tour in Patagonia!! Who’s joining? Got to test out the new Surly Instigator and Ice Cream Truck, and enjoy a giant bonfire/fatbike race and live band karaoke, and enjoy some yummy local brews! Not to mention a fun game night complete with moonshine, and a beer scavenger hunt. All in all, a fun time.